Update 5:45 p.m. Tuesday: A legal claim filed Tuesday against BART by the mother and two young children of a man killed by a transit police officer in January acknowledges that Sahleem Tindle had shot another man in the leg just before he was killed. 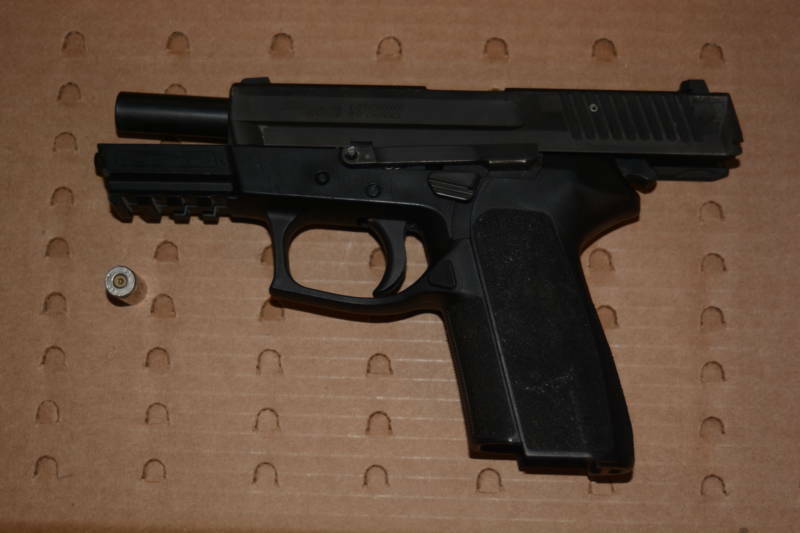 But the claim, generally seen as a precursor to a federal lawsuit, says Tindle had been struggling with the other man and had been disarmed by the time BART Police Officer Joseph Mateu arrived on the scene. The claim cites video from Mateu's body camera. "The other man who had been involved in the altercation with Mr. Tindle had been shot in the leg by Mr. Tindle and had disarmed Mr. Tindle of the handgun prior to Officer Mateu's arrival," the claim says. It says Mateu was writing a citation late in the afternoon on Jan. 3 when he heard two gunshots and ran toward the sound. He came upon two men wrestling across the street from West Oakland station. Mateu twice shouted at the men to show their hands, according to the claim, and they started to back away from each other. "As Mr. Tindle began to stand, making no sudden movement, Officer Mateu fired three gunshots at Mr. Tindle's back," the claim says. "Regardless of what happened before, at the time he shot and killed this young man, he did not have sufficient evidence to justify it," civil rights attorney John Burris said. "It should be prosecuted. As to what level of prosecution it is, that’s for the DA, but I certainly would start with murder." Burris, along with several members of Tindle's family, said initial descriptions of the shooting by the Oakland Police Department -- which is leading a criminal investigation -- indicated Tindle was armed and threatening the officer when he was shot. They want Mateu's body camera video to be publicly released. "It’s disturbing, no doubt about it – seeing a young man shot and killed," Burris said. "But on the other hand, you’ve been told that he was killed because he was pointing a gun at someone. That didn’t happen, and so the only way to correct that narrative is to show the video." 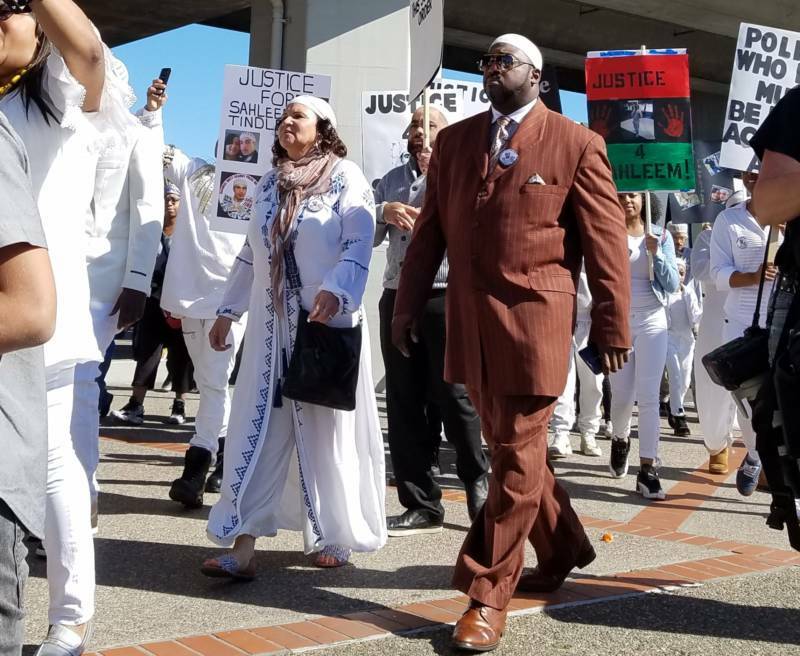 Although Oakland police made the video available to Tindle's family and their attorney last week, the department declined KQED's formal request for a copy, citing an open investigation. BART Police Chief Carlos Rojas said the video would be made public, but not likely any time soon. 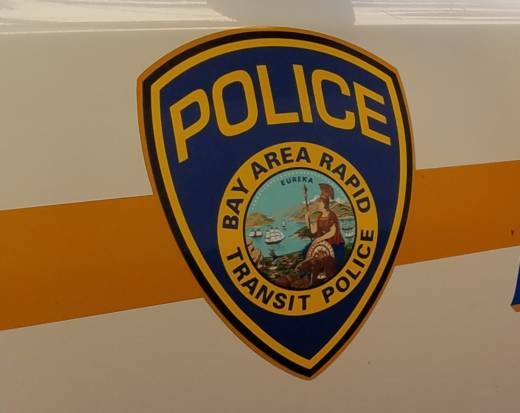 "Once the multiple investigations into this incident are complete, BART is committed to releasing all relevant information related to what happened including video from the involved officer’s body-worn camera," Rojas said in a written statement. More than 200 people gathered in protest outside West Oakland station Tuesday calling for the video's release and prosecution of the officer. "Sahleem did not deserve to lose his life," Tindle's sister Nalia Watkins said. "We want to see Officer Mateu charged." Original post, 3:40 p.m. Monday: The mother of a man fatally shot by a BART police officer near the West Oakland Station in January is calling on the transit agency and the Oakland Police Department to publicly release body-camera footage of the shooting, which she says shows her son was unarmed when he was shot three times in the back. Yolanda Banks was allowed to watch video of the Jan. 3 shooting last week at Oakland police headquarters, along with other close relatives of her deceased son, 28-year-old Sahleem Tindle, and attorney John Burris. 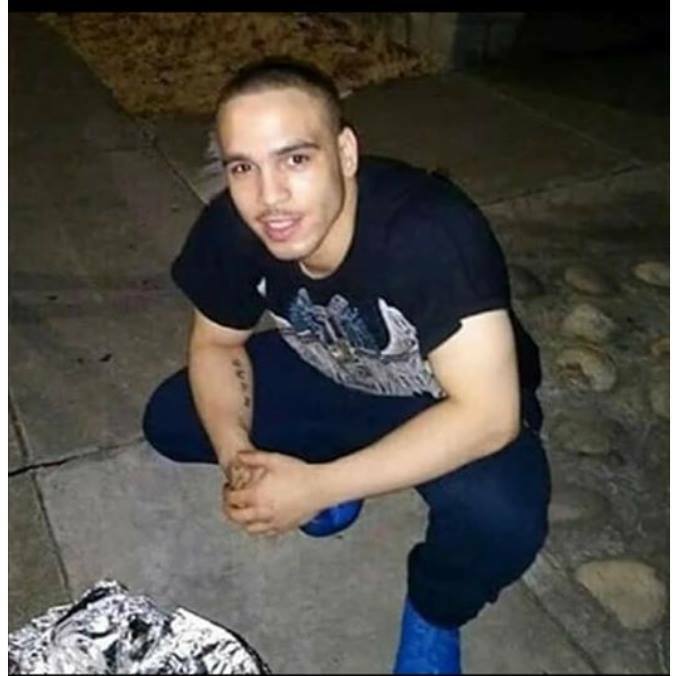 Banks said the video contradicts OPD's initial statements about the shooting -- specifically that Tindle had a handgun as he struggled with another man, as yet unidentified, when BART Officer Joseph Mateu responded on foot to "an active shooting taking place." "The officer observed two males in a struggle with each other; one of the men possessed a handgun," a Jan. 4 Oakland Police Department statement on the shooting says. "After several commands were given, the officer discharged his firearm striking the man who was in possession of the handgun; he later succumbed to his injuries. Investigators are attempting to clarify how the other man, who was listed in stable condition and has since been released from the hospital, sustained his injuries." The other man was reportedly shot in the leg. Both Banks and Burris said the body-camera footage never showed Tindle in possession of a gun. Both BART and the Oakland Police Department declined to release a copy of the video to KQED, citing ongoing investigations into the shooting. An Oakland police spokeswoman said the Police Department will generally allow family members and their attorneys to watch body-camera videos that are not otherwise publicly released. "We saw it with our own eyes -- that is not what happened," Banks said of Mateu's body-camera video. She said the video began with the officer running out of West Oakland Station and across the street, where the two men were fighting. "He ran over with his gun drawn and he said, 'Stop fighting, stop fighting,' " Banks said, adding that she did not hear the officer identify himself. "My son, Sahleem Tindle, broke loose from the guy that he was fighting. He held up his hands. He was unarmed, and his back was turned to the police officer. And that police officer let out three rounds in his back." Burris said the video should bolster a criminal investigation into the shooting. The Oakland Police Department and the Alameda County District Attorney's Office are charged with investigating the shooting for violations of criminal law. "I can certainly see that a person was shot in the back three times by an officer, and it doesn’t appear that he has a gun or was in the process of using deadly force against anyone, including the police officer, at the time," Burris said. "A gun is found nearby both men, but who possessed it, we don't know yet. And we don't know if the officer saw something other than what can be seen in the video." Banks, a longtime Bay Area artist, said Tindle often helped her set up for theatrical shows in San Francisco and was looking forward to starting a new job in Oakland. She said her son had two children -- an 8-year-old son and 2-year-old daughter. Banks said the family plans to file a civil lawsuit. "He has two children that have to be taken care of," she said. "He's no longer in their life." Banks said she doesn't believe Tindle had a gun, and said she has no idea what started the late-afternoon fight that ended with her son being fatally shot. "I have seen many mothers lose their children and now the shoe is on the other foot," she said. "I’m just, I’m really really crushed by it. My heart is so broken." A spokesman for BART said Officer Mateu had returned to full duty as of last week, and an internal investigation into the shooting, as well as a review by the BART Office of the Independent Police Auditor, are ongoing. Banks said she's planning a press conference and protest at the West Oakland Station for 10:30 a.m. Tuesday, where she will call for criminal charges against Mateu and for the body-camera video to be publicly released. "I would like for them to see it with their own eyes," she said, "and then they can be the judge of it." This report has been corrected. The original post contained a typo that made a quote from Yolanda Banks inaccurate. Banks said "guy" and not "gun."